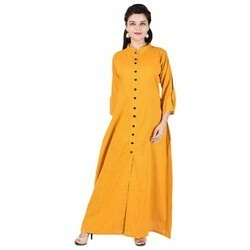 We are a leading Manufacturer of yellow long kurti, designer cotton kurtis, cotton printed kurta, pink cotton kurti, designer suit and cotton kurti from Jaipur, India. We are a remarkable entity, engaged in offering a stunning array of Designer Cotton kurtis. This designer kurti is designed by our competent workforce using optimum quality fabric & advance stitching techniques as per the latest trends of market. The provided designer kurti is completely checked by quality controllers before dispatching to the customer’s end. We provide this designer kurti from us on varied customized options. 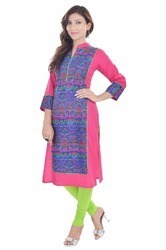 With huge experience in this field, we are offering a broad gamut of Pink Cotton Kurti. Made and designed at our latest machining facility, these kurtis are considered as the perfect wear for festivals, parties and wedding ceremonies. The provided kurti is completely checked by quality controllers before dispatching to the customer’s end. We provide this kurti from us on varied customized options. Our in-depth search of the markets allows us to offer a wide assortment of Designer Suit. The fabulous all-over print makes this Kurti a must have in every design conscious women collection. We provide this kurta in numerous customized options & designs as per the demand of our customers. Our offered kurta is ideal to be worn in offices, meetings, parting, shopping, outings etc due to its beautiful design. With huge experience in this field, we are offering a broad gamut of Cotton Kurti. Made and designed at our latest machining facility, these kurtis are considered as the perfect wear for festivals, parties and wedding ceremonies. The provided kurti is completely checked by quality controllers before dispatching to the customer’s end. We provide this kurti from us on varied customized options.